This Chocolate Peanut Butter Cheesecake Dip is the perfect easy dessert recipe. You can whip this up in just minutes. It is a perfect dessert for entertaining. 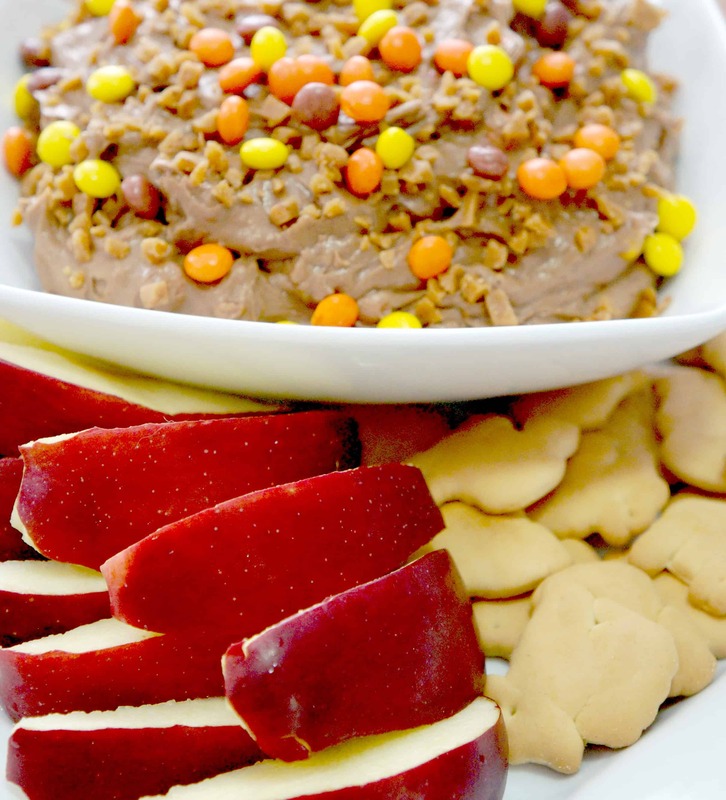 If you love chocolate and peanut butter you will love this dip. I am obsessed with all things chocolate and peanut butter. Most of the desserts I make contain those two ingredients. And of course I also love cheesecake. Who doesn’t? So I wanted to make a chocolate peanut butter dessert that would taste like cheesecake without all the time and effort that goes into an actual cheesecake. When I was in the dairy section at the grocery story I noticed Philadelphia Chocolate Cream Cheese. I was super excited and brought it home to experiment. I am so happy with how this recipe turned out. Next time you’re having people over pull out this recipe. Chocolate, peanut butter and cream cheese come together in this delicious dip recipe, perfect for your next party. All you have to do is cream together some chocolate flavoured cream cheese, peanut butter, brown sugar and white sugar. Add a bit of cream to get a nice consistency and finish off with mini Reese’s Pieces candies and Skor Bits. This simple dip with Reese’s Pieces and Skor Bits is so tasty you’ll just want to sit and eat it with a spoon but you should probably serve it with some fruit and cookies. I’ll confess that I ate about half of this by myself. I couldn’t resist it was just sitting in the fridge calling my name. 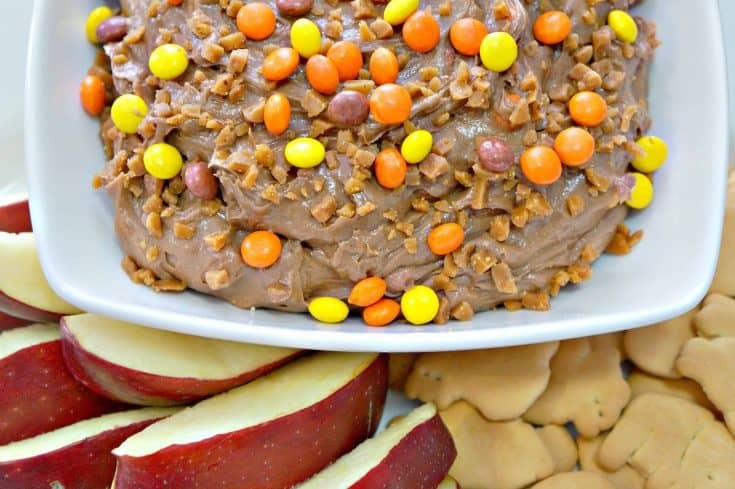 Try this Chocolate Peanut Butter Cheesecake Dip next time you’re entertaining! You won’t regret it. If you are looking for more chocolate peanut butter dessert ideas check out Peanut Butter Cookie S’Mores Cups, Peanut Butter Ritz Bits Toffee and Reese’s Pieces Cream Cheese Brownies. Combine cream cheese and peanut butter with electric mixer. Add cream, white sugar and brown sugar and continue mixing. 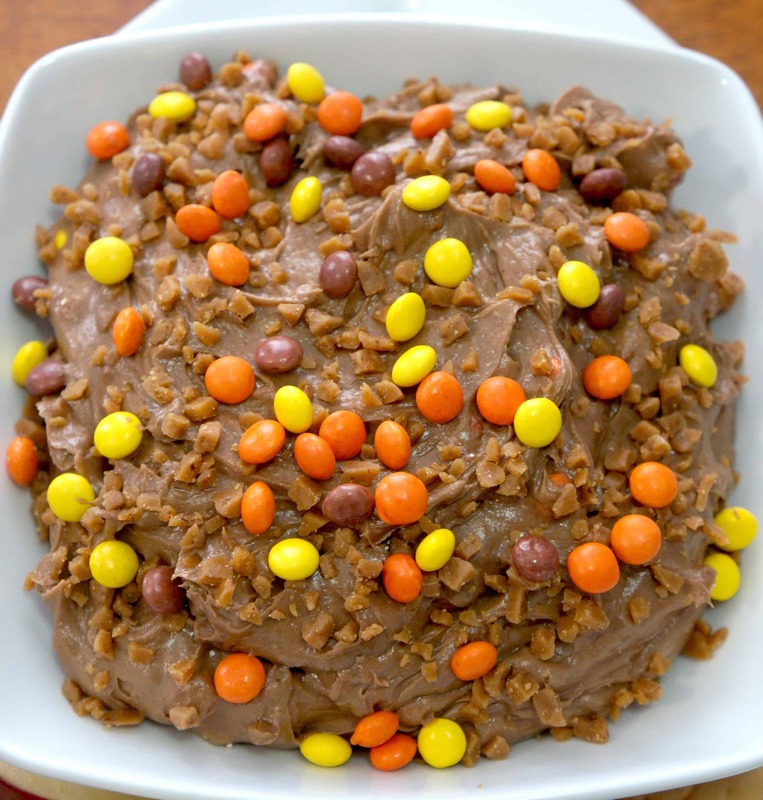 Stir in 1/2 cup Skor bits and 1/3 cup mini Reese's Pieces. Spoon dip into serving dish and sprinkle remaining Skor bits and Reese's Pieces on top.